This album’s been around for a few months but it slipped under the MusicRiot radar until we heard about The Kennedys touring to support it in the UK, so I guess that justifies telling you all about it a little late. 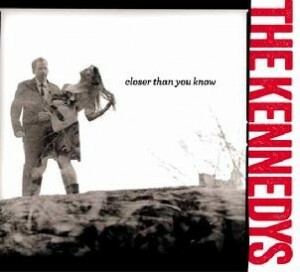 This is the twelfth album the husband and wife team, Pete and Maura Kennedy, have released as The Kennedys, although they have both also been involved with various side projects. The Kennedys are one of those “well-kept secret” bands that have devoted fans but, for some reason, have never quite become massively successful. “Closer than You Know” is an interesting piece of work. Just for once I agree with a statement from a press release; this is “pop for grown-ups” and, more importantly, it’s music for people who really care about music. There isn’t any filler on this album; all of the songs are good and, in my opinion, at least a couple are great. It’s difficult to define their style, but if you take folk-rock as your starting point, add a bit of Celtic seasoning and throw in 60s UK pop and The Byrds, you won’t be far off the mark. The opening song “Winter” sets the scene for the album with Pete’s finger-picked guitar backing Maura’s breathy, multi-tracked, vocals before moving into the country-tinged “Rhyme and Reason”, followed by the story of a second generation illegal immigrant “Marina Dream”, which has a Celtic folk feel and a rhythm that evokes perfectly the flight and pursuit experienced by the girl at the centre of the song. The middle section of the album moves across a variety of styles instrumentally and vocally featuring laconic Richard Hawley style-guitar, discordant synthesised strings and classical nylon-strung guitar arrangements. I’m not dismissing these songs by any means, because they’re all good but, for me, after a couple of listens, the album builds up to one focal point. From the opening sus4 chords of “Big Star Song” I was hooked. The song is a celebration of Alex Chilton’s work and a lament for his passing; it’s a perfect marriage of words and music which evokes an earlier era while sounding completely contemporary. Like many great songs, this has several layers and, lyrically, it’s also about losing something or someone other than Alex Chilton. I don’t know what that something else is and I suspect it’s so personal that I don’t really want to know. Whichever way you look at it, this is a great song. “Big Star Song” is followed by a U2 cover, “Wild Honey” , “Happy Again” (which has more than a hint of Rosanne Cash vocally) and “Winter Lies”, which completes the cycle. I would have reviewed this as a good album without “Big Star Song”, but with that song, it’s a very good album indeed. You can hear loads of influences at work here (you can probably add Stevie Nicks and maybe Emmylou Harris to the ones I’ve already listed), but this is fresh and original. My only general criticism is that the album feels slightly over-produced at times. This may be a reaction to working as a duo because it must be natural at times to over-compensate by throwing too much at the production and adding another extra guitar part or vocal harmony. It’s a minor criticism and I’m really looking forward to hearing the live interpretations of the songs later this week. “Closer than You Know” is out now (Catalogue No. TK1208), distributed by Proper Music Distribution.